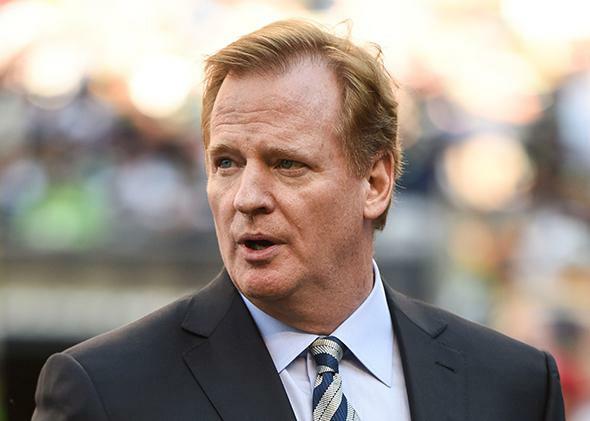 Roger Goodell, NFL jerk watch: How much should you loathe the pro football commissioner? How much should you loathe the pro football commissioner? NFL Commissioner Roger Goodell before the game between the Seattle Seahawks and the Green Bay Packers on Sept. 4, 2014. Why he might be a jerk: When you list everything he’s done since being named commissioner in 2006, he sounds like a pretty big jerk. During his tenure, Goodell has infuriated players, media, fans, and members of Congress. No backlash has been more vocal, or more justified, than the reaction to his treatment of Ray Rice’s assault of his then-fiancée, Janay Palmer. The anger over the NFL’s initial decision to suspend Rice for just two games encapsulates the biggest criticism of his reign. Namely, that Goodell is a sanctimonious hypocrite who glosses over the league’s greatest misdeeds—be they existential problems like brain damage to players, typical corporate behavior like the NFL’s dismissive treatment of labor, or teensy issues like tainted Super Bowl results—all while attempting to look like he’s bravely tackling those problems. Since becoming Commissioner, my focus has been on ensuring that the NFL is held in the highest regard by our fans, players, business partners, and public authorities. My commitment has always been to do what is right and to protect the integrity of the game, both now and long into the future. This was his apology. Yes, Goodell was changing his stance because of public pressure. But really, more deeply, he was doing so because the commissioner is the defender of the integrity of the game. The Rice fiasco was just Goodell’s latest effort to hold himself up as the NFL’s white knight while simultaneously attempting to cover up the league’s endemic problems. The end goal: to maintain a status quo that is earning his bosses—the league’s owners—billions of dollars. We must protect the integrity of the NFL. The highest standards of conduct must be met by everyone in the NFL because it is a privilege to represent the NFL, not a right. In a statement oozing with paternalism, Goodell made himself the final arbiter of NFL justice. He was the law. The commissioner’s subsequent punishments were uneven, and his rulings often appeared to favor management. In 2009, then–Oakland Raiders head coach Tom Cable was not punished for allegedly breaking an assistant coach’s jaw during an altercation, even after it surfaced that Cable had a history of domestic violence accusations. Punishments for domestic violence have been especially spotty, in fact, with league and team officials relying on the canard of “due process” to avoid having to suspend or release star players. On the rare occasion that they have been punished by the league, domestic abusers have been suspended for half as many games on average as other violators of Goodell’s conduct policy. The personal conduct policy has been a highly visible, superficial gloss, one designed to help the league move on from what it sees as an image problem. This is standard operating procedure for Goodell. When the New England Patriots were caught recording hand signals of opposing teams in 2007, it had the potential to shatter the reputation not only of one of the league’s greatest dynasties, but of the very integrity of three different Super Bowl results. Goodell mandated hefty fines and penalties to Patriots coach Bill Belichick and the team. He then destroyed all of the tapes of the spying in what had the very strong whiff of a cover-up. Goodell explained that he had destroyed the tapes as a form of punishment to the Pats: “It was the appropriate thing to do, and I think it sent a message.” That message had the benefit of sending the details of a major NFL scandal into the memory hole. We are all accountable and responsible for player health and safety and the integrity of the game. We will not tolerate conduct or a culture that undermines those priorities. No one is above the game or the rules that govern it. The problem was that Goodell never proved his biggest specific allegations against the Saints and their players: that the team targeted particular opponents and paid out if they were brutally injured in the course of play. His suspensions against the players were eventually dismantled on review by Goodell’s mentor and predecessor, Paul Tagliabue. As late as last year’s Super Bowl, Goodell was still refusing to publicly acknowledge the link between his sport and brain damage. He has still yet to make a strong public statement on football and concussions, even as his league last week released its own actuarial data that acknowledged that NFL players were significantly more likely than the general population to suffer from brain trauma at an early age. Why he might not be a jerk: Goodell serves at the pleasure of the NFL owners, so perhaps he’s merely a lackey for a bunch of bigger jerks. This is the common Goodell defense. Every time he equivocates, covers up some scandal, or declares himself the defender of the league’s integrity, he’s just doing it to protect his bosses’ multibillion-dollar business. In the years since he took over as commissioner, and even going further back to his executive VP days, Goodell has been really good at protecting those billions. The league now earns $10 billion in annual revenue, and Goodell’s aim is for that number to increase to $25 billion by 2027. He was so good at making money that before he took over as boss there was concern he was too good at it! “Some owners worried that Goodell ‘was too much in the thrall of revenue building,’ ” Michael Oriard explained in the book Brand NFL: Making and Selling America’s Favorite Sport. Goodell isn’t a bad man! He just happens to do the NFL’s dirty work because that’s his job. The reality, though, is that you don’t have to be a jerk to be the commissioner of a major sports league (although it probably helps). Look at the NBA’s new boss, Adam Silver. When faced with the Donald Sterling scandal, Silver acted swiftly and decisively to give Sterling a lifetime ban. Whether you thought it was the right call or it wasn’t Silver’s call to make, there can be no questioning that his completely justified moral opprobrium was backed up by action. Just as important, Silver’s toughness in that one case hasn’t been followed by moral grandstanding. You don’t have to pride yourself on your integrity to see that doing the right thing without making a big show of it is a great way not to be a jerk. Jerk score: 2 out of 3 for style, because of “boardroom lobster face.” 3 out of 3 for technique, for developing the power to silence major media organizations. 3 out of 3 for consistency, because he can be a jerk on the smallest issues, like supporting Dan Snyder’s racist team name, as long as he think it will accrue him some benefit down the line. And 1 out of 1 in the category of “James Harrison Thinks I’m More Powerful Than Richard Nixon.” 9 out of 10 for NFL Commissioner Roger Goodell.